Was born at Gurney Court off Magdalen Street. (The Quaker prison reformer Elizabeth Fry was also born in Gurney Court. Her portrait is on the back of the £5 note.) There are plaques on the wall of the alley way leading into the court commemorating both women. Harriett's childhood was blighted by ill heath (deafness) and poverty. Today, she is chiefly remembered for her essays on social reform and her work as a campaigning journalist - however she also wrote moral tales for children. In 1834 she travelled to America and campaigned against the slavery trade - even though this put her own life in danger. In 1837 her book Society in America was published. In 1845 she settled in the Lake District and became a friend of William Wordsworth. As a child she frequently attended services at the Octagon Chapel on Colegate. However, later in life she abandoned all religious faith. Her other published works include: History of the Thirty Years' Peace, The Philosophy of Comte, Laws of Man's Social Nature, Deerbrook (a novel) and The Hour and the Man (a biography of Toussaint L'Ouverture). 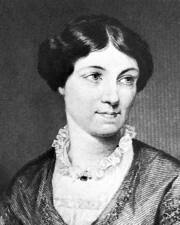 Harriet Martineau was almost certainly a product of the radical (dissenting) tradition that prevailed in Norwich. Cut off from the rest of the country, Norwich has always been an independent city fostering non-conformist values. Even today the motto of the county of Norfolk is 'Do Different'. Unfortunately her link with Norwich has been largely forgotten. Martineau Lane was actually named after here uncle Dr Philip Meadows Martineau.